Portage or portaging is the practice of carrying water craft or cargo over land, either around an obstacle in a river, or between two bodies of water. 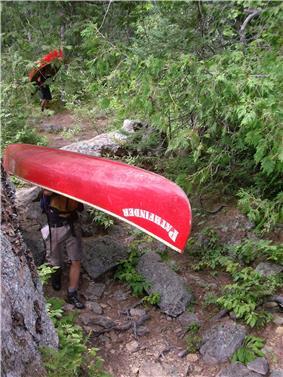 A place where this carrying occurs is also called a portage. Early French explorers in New France and French Louisiana encountered many rapids and cascades. The Native Americans carried their canoes over land to avoid river obstacles. Over time, important portages were sometimes provided with canals with locks, and even portage railways. 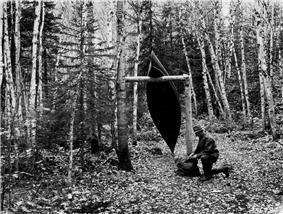 Primitive portaging generally involves carrying the vessel and its contents across the portage in multiple trips. Small canoes can be portaged by carrying them inverted over one's shoulders and the center strut may be designed in the style of a yoke to facilitate this. Historically, voyageurs often employed tump lines on their heads to carry loads on their backs. Portages can be many kilometers in length, such as the 19-kilometre (12 mi) Methye Portage and the 8.5-mile (13.7 km) Grand Portage (both in North America) often covering hilly or difficult terrain. Some portages involve very little elevation change, such as the very short Mavis Grind in Shetland, which crosses an isthmus. 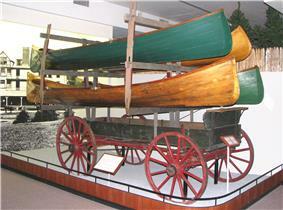 This section deals mostly with the heavy freight canoes used by the Canadian Voyageurs. 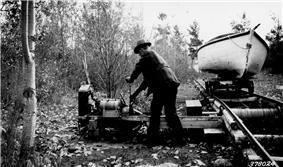 Portage trails usually began as animal tracks and were improved by tramping or blazing. In a few places iron-plated wooden rails were laid to take a handcart. Heavily used routes sometimes evolved into roads when sledges, rollers or oxen were used, as at Methye Portage. Sometimes railways (Champlain and St. Lawrence Railroad) or canals were built. When going downstream through rapids an experienced voyageur called the guide would inspect the rapids and choose between the heavy work of a portage and the life-threatening risk of running the rapids. If the second course were chosen, the boat would be controlled by the avant standing in front with a long paddle and the gouvernail standing in the back with a 2.7-metre (9 ft) steering paddle. The avant had a better view and was in charge but the gouvernail had more control over the boat. The other canoemen provided power under the instructions of the avant. Small railway portage in the U.S. Going upstream was more difficult, as there were many places where the current was too swift to paddle. Where the river bottom was shallow and firm, voyageurs would stand in the canoe and push it upstream with 3-metre (10 ft) poles. If the shoreline was reasonably clear the canoe could be 'tracked' or 'lined', that is, the canoemen would pull the canoe on a rope while one man stayed on board to keep it away from the shore. (The most extreme case of tracking was in the Yangtze River.) In worse conditions, the 'demi-chargé' technique was used. Half the cargo was unloaded, the canoe forced upstream, unloaded and then returned downstream to pick up the remaining half of the cargo. In still worse currents, the entire cargo was unloaded ('décharge') and carried overland while the canoe was forced upstream. In the worst case a full portage was necessary. 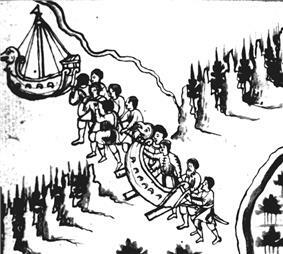 The canoe was carried overland by two or four men (the heavier York boats had to be dragged overland on rollers) The cargo was divided into standard 41-kilogram (90 lb) packs or pièces with each man responsible for about six. One pack would be carried by a tumpline and one on the back (strangulated hernia was a common cause of death). To allow regular rests the voyageur would drop his pack at a pose about every 1 kilometre (0.5 mi) and go back for the next load. The time for a portage was estimated at one hour per half mile. The Diolkos was a paved trackway in Ancient Greece which enabled boats to be moved overland across the Isthmus of Corinth between the Gulf of Corinth and the Saronic Gulf. It was constructed to transport high ranking Despots to conduct business in the justice system. 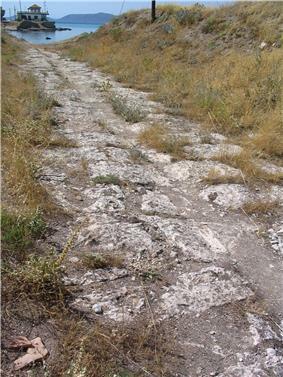 The 6 km (3.7 mi) to 8.5 km (5.3 mi) long roadway was a rudimentary form of railway, and operated from around 600 BC until the middle of the 1st century AD. The scale on which the Diolkos combined the two principles of the railway and the overland transport of ships was unique in antiquity. There is scant literary evidence for two more ship trackways referred to as diolkoi in antiquity, both located in Roman Egypt: The physician Oribasius (c. AD 320–400) records two passages from his 1st century AD colleague Xenocrates, in which the latter casually refers to a diolkos close to the harbor of Alexandria, which may have been located at the southern tip of the island of Pharos. Another diolkos is mentioned by Ptolemy (AD 90–168) in his book on geography (IV, 5, 10) as connecting a false mouth of a partly silted up Nile branch with the Mediterranean Sea. A map of the trip of the Venetian warships. 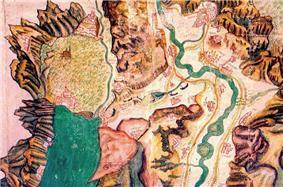 The land link between Adige river and Garda lake in Northern Italy, hardly used by the smallest watercraft, was at least once used by the Venetian Republic for the transport of a military fleet in 1439. The land link is now somewhat harder because of the disappearance of Loppio lake. In the Adirondacks at portages that were heavily used, horse-drawn wagons like this one were furnished with racks for carrying several boats at once, for a fee. This example is typical of those used in the 1890s. (Adirondack Museum). In the 8th, 9th and 10th centuries, Viking merchant-adventurers exploited a network of waterways in Eastern Europe, with portages connecting the four most important rivers of the region: Volga, Western Dvina, Dnieper, and Don. The portages of what is now Russia were vital for the Varangian commerce with the Orient and Byzantium. At the most important portages (such as Gnezdovo) there were trade outposts inhabited by a mixture of Norse merchants and native population. The Khazars built the fortress of Sarkel to guard a key portage between the Volga and the Don. After Varangian and Khazar power in Eastern Europe waned, Slavic merchants continued to use the portages along the Volga trade route and the Dnieper trade route. The names of the towns Volokolamsk and Vyshny Volochek may be translated as "the portage on the Lama River" and "the little upper portage", respectively (volok means "portage" in Russian, derived from the verb "to drag"). In the 16th century, the Russians used river portages to get to Siberia (see Cherdyn Road). Tarbert is a common place name in Scotland and Ireland indicating the site of a portage. Portages played an important role in the economy of some African societies. For instance, Bamako was chosen as the capital of Mali because it is located on the Niger River near the rapids that divide the Upper and Middle Niger Valleys. Places where portaging occurred often became temporary and then permanent settlements. The importance of free passage through portages found them included in laws and treaties. One historically-important fur trade portage is now Grand Portage National Monument. Recreational canoeing routes often include portages between lakes, for example, the Seven Carries route in Adirondack Park. Numerous portages were upgraded to carriageways and railways due to their economic importance. The Niagara Portage had a gravity railway in the 1760s. The passage between the Chicago and Des Plaines Rivers was through a short swamp portage which seasonally flooded and it is thought that a channel gradually developed unintentionally from the dragging of the boat bottoms. The 1835 Champlain and St. Lawrence Railroad connected the cities of New York and Montreal without needing to go through the Atlantic. Many settlements in North America were named for being on a portage. Portages existed in a number of locations where an isthmus existed that the local Māori could drag or carry their waka across from the Tasman Sea to the Pacific Ocean or vice versa. The most famous ones are located in Auckland, where there remain two 'Portage Road's in separate parts of the city. The small Marlborough Sounds settlement of Portage lies on the Kenepuru Sound which links Queen Charlotte Sound at Torea Bay. ^ Fraser 1961, pp. 134f.